The Minecraft Lucky Block Mod is undoubtedly a great addition for Minecraft addiccts. It adds a single block like the old coin blocks in Super Mario Bros. The lucky block opens up 100 possibilities. You can spawn entities, animals, and structures. Like its name, it is all about luck. You can spawn good or bad rewards. Better still, you can generate lucky blocks from gold ingots, and add the amount of luck. If you get to the max +100, you could increase your chances of positive rewards significantly. Well, as soon as you mine the block, all you need to do is break it and cross your fingers. What can you do with the lucky block? After mining the lucky block, breaking it opens up many possibilities. Like its predecessor, you could get some gold ingots (equivalent to the Marios coins). It could also drop items, spawn entities, monsters and animals, structures, sticks, giants, diamonds and fireworks too. All items, structures, and entities have an equal chance of being dropped or spawned. You can also find it in your world. The Minecraft lucky block mod opens up a hundred possibilities. Some great things that you can get include iron, diamond, coal or gold. The mod makes gold ingots even more important. The best reward that you can get is a structure, for instance, a chest, temple, or fort. You can turn the ingots into lucky blocks. If you have too much gold, you can add luck to the (already lucky) block. To do this, create a lucky block. Create subsequent blocks. Surround each subsequent block with more gold, until you get to the max, the +100 lucky block. This way, you will get more valuable items and fewer enemies. The block has a downside to it, though. You could destroy your entire world by breaking the block. It could spawn explosions or harmful enemies. You could, for instance, get hit with poison that will blind or damage your character. Woe unto you if you do get an Ender dragon. You could also get traps like water, anvils, and lava. You may need to back up your world, actually. You can also create a map for this specific mod. While the mod may look like too high a risk, it is what makes the game fun. You just never know what to expect. It could be a matter of luck. Boost your world, or destroy it. The Minecraft lucky block mod is great for multiplayer servers and even for making game maps. My mind when I play this mod? The Minecraft lucky block mod is all about surprises – pleasant ones or dangerous ones. When playing the mod, you should be decisive – weigh your risks. If you can, minimize them. Add as much gold. If you can, get to the max. Despite trying to minimize the risk, you cannot help but be anxious. You just never know. You will definitely be nervous. You need to make a decision though and cross your fingers or close your eyes. Just prepare your mind for any eventuality. You could be pleasantly surprised, or totally devastated (when you open your eyes). All the same, backing your world up could come in handy. 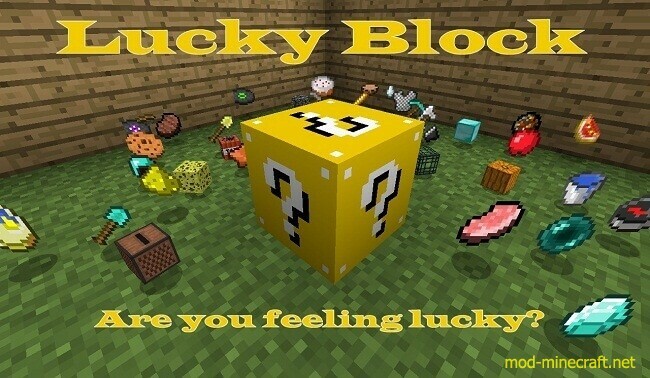 The Minecraft lucky block mod is a great tweak for all Minecraft lovers. You no longer need to stack too much gold if you can turn it into something more valuable. While it may sound like a great achievement, prepare for anything. You just never know what rewards you may get -a temple or the ender dragon. It is all about luck.